Fairfield Prep’s Alexey Linsenmeyer pitches against Greenwich in the FCIAC-SCC Challenge on Friday. The Jesuits won 5-1. It was not a total whitewash, but it was close. The SCC dominated the early season FCIAC-SCC Challenge, going 11-4 over the weekend. 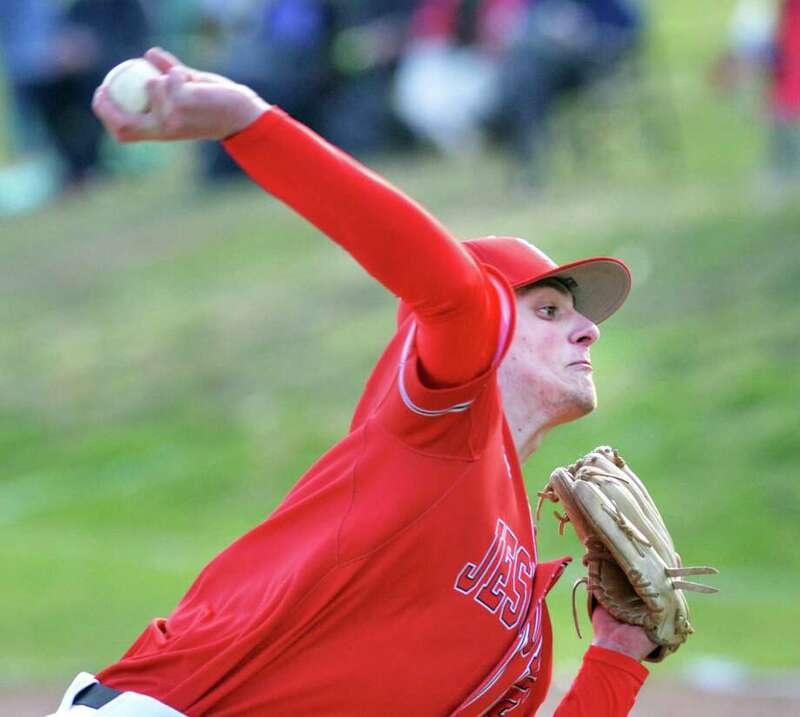 Trinity Catholic-Wilbur Cross scheduled for Tuesday and Wilton-Hand (April 17) will have no impact on the overall outcome as the SCC easily snagged bragging rights, for now. Of course, the CIAC Class LL championship still resides in Westport, safely in the hands of the Staples Wreckers. For their part, No. 1 Staples picked up one of the FCIAC’s four wins, doing so in dramatic fashion on a three-run walkoff home run by Drew Rogers, giving the reigning champs a 5-3 victory over Xavier. St. Joseph’s 11-2 win over Sheehan Sunday gave the FCIAC one more win from a Top-10 team. Cheshire apparently did not take kindly to only receiving a total of 10 points in the first GametimeCT poll and took out its frustrations on its opponents. First, Cheshire beat Amity 8-3 on opening day, which is becoming a thing. If you recall, Cheshire snapped Amity’s 28-game win streak last season. A streak which began after Cheshire had ended the Spartans’ 19-game winning streak in 2016. In the win this season, West Point-bound Ben DeLaubell tossed a five-hit shutout over six innings, striking out six. Ben Shadeck then pitched six shutout innings as the Rams defeated Trumbull 2-0 in the FCIAC-SCC Challenge. Obviously, Cheshire (2-0) is now firmly in the Top 10, jumping all the way up to No. 3 in this week’s poll, and should be considered among the best teams in the state moving forward. After last week began with snow, grounds crews around the state deserve a special shout-out for having fields ready to play on by Thursday. In fact, only a handful of fields were not playable by the weekend, meaning postponements were kept to a minimum. We know a lot of people are working hard to get fields ready, but a special note needs to be made for the crew at West Haven. They not only had Whitey Piurek Field ready to go Saturday morning for West Haven and Career, they came back and had the field in tip-top shape when Notre Dame-West Haven and Westhill used the field later that afternoon.